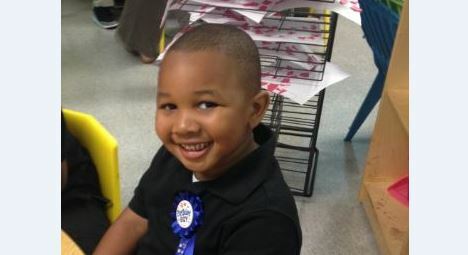 Meet four-year-old Keyonta Wyatt. On September 2, by the time first responders arrived at mother’s Mansfield, Louisiana home, it was fully engulfed in flames. At first it was believed that all four residents had made it outside, but then the family noticed that little Keyonta was not there. Someone said he had gone back inside to get his toys. People said it was too late to go in after him, but Keyonta’s uncle Michael Anthony Brown could not accept that. He ran into the flaming house and emerged injured, but with his little nephew alive. Airlifted to a Shreveport hospital and initially listed in critical condition, the boy survived with only superficial burns to his face and arms. 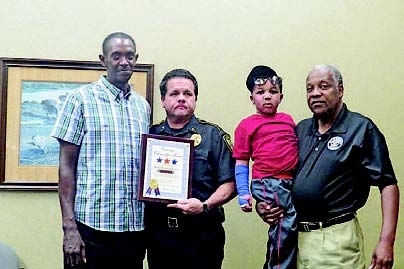 Brown was hailed as a hero in Mansfield, and was presented with a rare Outstanding Citizenship Award by the mayor and police chief.This year Brown saved his little nephew. Last year he saved himself. Cornered in his Lake Charles residence by a drunken and belligerent man a hundred pounds heavier, who blocked his every attempt to leave, Brown was forced to arm himself with a kitchen knife. This and several verbal warnings did not dissuade the attacker, who repeatedly rushed him, was eventually stuck, and ultimately bled to death. Brown was booked into jail for Second Degree Murder. Judge G. Michael Canaday set bond at $1.5 million. After a preliminary examination before Judge Ronald F. Ware, Asst. DA Bobby Holmes took the case to a Calcasieu Parish grand jury who returned an indictment for Manslaughter. Finding that Brown has no felony record and posed no flight risk, Judge Ware set his Manslaughter bail at $15,000. Brown posted bond and moved to Mansfield to live with his sister, Keyonta’s mother. If Brown’s bond had remained at $1.5 million, little Keyonta would have perished in that fire on September 2.Judge Ware recused himself from the case, and it was re-allotted to Division A, where Special Asst. DA Rick Bryant, formerly the elected DA, made no move to upgrade Brown’s charge. However, felony prosecutions in Div. A were recently taken over by Asst. DA Lori Nunn. She soon informed Brown’s attorney that unless he promptly pleads guilty to Manslaughter which carries up to forty years, then without any new evidence she will seek a Second Degree Murder indictment against Brown from a second grand jury. She gave a half-day’s notice that she was going to do this on Thursday, October 16, but Brown, who wished to testify before the grand jury, could not arrange his transportation from Mansfield on overnight notice. *The author is Michael Anthony Brown’s court-appointed attorney. Finding the right words is impossible. I am sick to my stomach at this injustice. Is there evidence other than Brown’s testimony for self-defense. WOW! It saddens me that we as citizens cannot defend ourselves without being penalized by the justice system. It also makes my blood boil the money hungry and vote thirsty politicians want so bsd to make a name for themselves that the would do such an injustice as what Mrs. Nunn is doing. For once can the justice system just do what’s right? Just goes to show you, not all court appointed attorneys are not caring…some actually have a heart…i commend you on your fight. Ms. Nunn should be very ashamed of herself…look at the evidence and the situation…self defense not manslaughter or second degree murder…heck I’m not an investigator or an attorney and I can see that…blindfolded!!! It seems clear Assistant DA Nunn is either racist or burning with ambition or both. Disgusting. Update: http://www.kplctv.com/story/27321201/mansfield-hero-facing-charges-in-roommates-death See also my Facebook page for numerous links of the reportage of the original arrest for Second Degree Murder, the indictment for Manslaughter, and the fire rescue. To ckpk3337: Yes. Another resident of the home is blind, but heard conversation leading up to the incident. I am not revealing grand jury testimony. This is from regular discovery in the case. The KSLA story seen on KPLC contains an error in that it characterized the deceased as a “roommate.” He did not stay there except when he had weekend visitation with his children, which was not on this occasion.